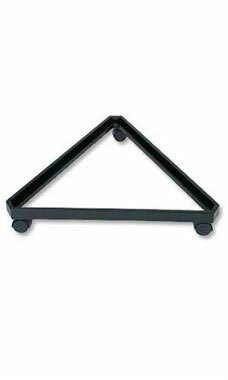 Make your Gridwall more easily moveable by purchasing this Black Wire Grid Wall Triangular Base with casters. Selling your merchandise will never be difficult again with this attractive, versatile Triangle Grid base. The overall size of the base is 24'' x 24'' x 24''. To move your display, simply roll it across your showroom floor! At the lowest price that you will find, this is a great deal and should be purchased now! In stock and available for immediate shipment. This adds great dimension to the layout of the store. It is very durable and no worries of the grid walls falling over on anyone! This item comes fully assembled and is very sturdy when the casters are added. Gridwall is not hard to add to this base.